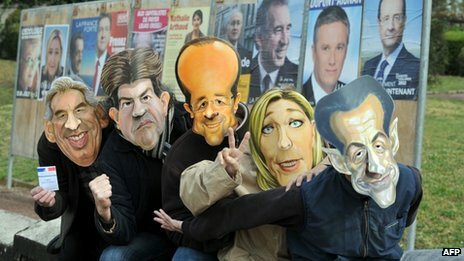 France’s tough line on Syria won’t butter up with the anticipated exit of President Nicolas Sarkozy from the Elysée. Nor would France’s Arab Spring policy change much, writes Ms Randa Takieddine, Paris bureau chief for the Saudi-owned daily al-Hayat who is into her fourth coverage of French presidential campaigns. The first round of the 2012 presidential election will take place on Sunday, with a most likely second round runoff being held on May 6. French Socialist presidential candidate François Hollande is projected by opinion polls to beat Sarkozy in the runoff to become France’s first Socialist president for 17 years. Takieddine says Hollande is all but assured of victory in the second round, because he would get votes transferred from Jean-Luc Mélenchon and Eva Joly, respectively the Left Party and Green Party candidates. But she says the votes for rightist and centrist candidates, Marine Le Pen and François Bayrou, are unlikely to be moved to Sarkozy in the runoff. With first round voting 72 hours away, Takieddine writes, “the question is whether a new president would change France’s Middle East policy. The answer is that French interests require France’s Arab policy to remain unchanged, irrespective of the choice of foreign minister. Certainly the style or approach might change, depending on the person in charge. “On the Arab-Israeli issue, every new French administration has aspired to play a peacemaking role, albeit through the European Union. There is no doubt Hollande would continue to support the Arab Spring. “As for Syria, Hollande has explicitly condemned the practices of Bashar al-Assad’s regime. “Readying the Middle East files for a new president would be career diplomats from all political hues. Denis Pietton, the former French ambassador to Lebanon who is known for his Left-leaning views, was recently appointed head of the Middle East and North Africa desk at the Quai d'Orsay because he is one of France’s best Orientalists. “True, most Arab governments know little about Hollande and would rather see Sarkozy win a second term. But French foreign policy remains a constant. It was far from being a contentious issue in the campaign. “Nonetheless, should Hollande win the presidency, he would be well-advised to opt for an adept foreign minister -- someone like Hubert Védrine, one of France’s best ministers of foreign affairs (from 1997 to 2002). -- Or maybe Martine Aubry, First Secretary of the Socialist Party. That’s if Hollande did not name her prime minister.